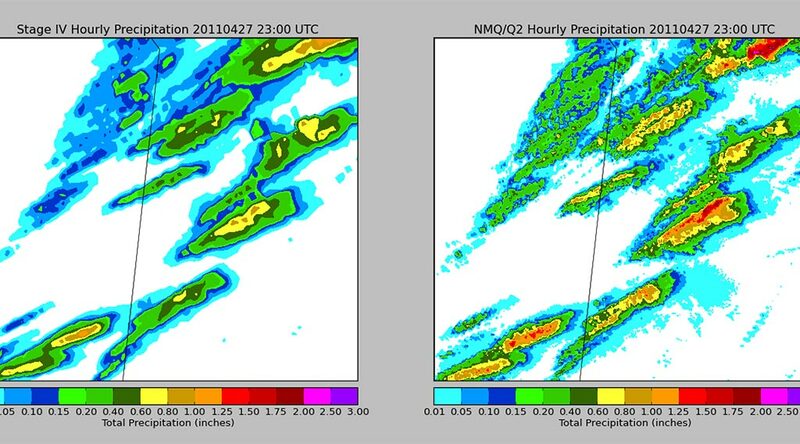 Comparison of spatial resolution in the operational Stage IV gridded precipitation product (left), and the NMQ/Q2 reanalysis product (right). One of the most challenging and significant projects undertaken at NCICS has been the reprocessing of NEXRAD Level II radar data to produce a suite of high-resolution gridded precipitation data products. The project is a collaborative effort between NCICS, NOAA’s National Centers for Environmental Information (NCEI), and the Cooperative Institute for Mesoscale Meteorological Studies, located at NOAA’s National Severe Storms Laboratory (NSSL) in Norman, Oklahoma. Over the course of this multi-year project, 140 terabytes of NEXRAD Level II data for 2001 through 2011 were transferred from NCEI’s archive to NCICS’ high performance computing cluster, where they were reprocessed using the National Mosaic and Multisensor Quantitative Precipitation Estimate (NMQ/Q2) algorithms developed at NSSL. The end result is a wide variety of severe weather products, three-dimensional radar reflectivity, and quantitative precipitation estimates at a much finer temporal frequency (five-minute intervals) and spatial scale (0.01°, 1 km) than was previously available. The project also demonstrated the value of our collocation with NCEI, as the proximity to both the data archive and NCEI’s data experts facilitated the data transfer and management process. Applied research using the new data are also underway, including merging the reprocessed data with rain-gauge observations and investigating connections between heavy rainfall and traffic fatalities. The product is also being used in the SERDP precipitation research project. The reprocessed data are in the process of being moved into NCEI’s archive. NCICS is also facilitating the transfer of the raw Level II NEXRAD data to several cloud-based providers as part of NOAA’s Big Data project.